Known issues and feature requests are tracked on GitHub. Want to help translate? I'm now using CurseForge's localisation system. 0. Why do friendly nameplates look different in instances? Blizzard has blocked addons from modifying friendly nameplates in instances as of 7.2 (read their statement here). We can't do anything about this. 1. Only the nameplate of my target shows up! That's because of the default interface option under Esc > Interface > Names > "Always show nameplates". When that option is NOT checked (the default), only the nameplate of your current target will be shown while out of combat. When it IS checked, nameplates will always be shown, depending on other CVars (FAQ 1a, for instance) and settings in /knp. 1a. Friendly NPCs don't have any nameplates! This is due to a CVar Blizzard added in 7.1. There's a checkbox for it under /knp > CVars > "Always show friendly NPCs' nameplates"
2. Some nameplates still aren't showing up! They're probably disabled. The game's default options for nameplate visibility are under Esc > Interface > Names. The default keybinds for them are V, Ctrl+V, and Shift+V. Alternatively, if you're in a large raid or another situation where many nameplates are visible then, as of Legion, the maximum number of visible nameplates is limited to 40. Addons can't change this. 3. Why are nameplates fading and changing size as they move? 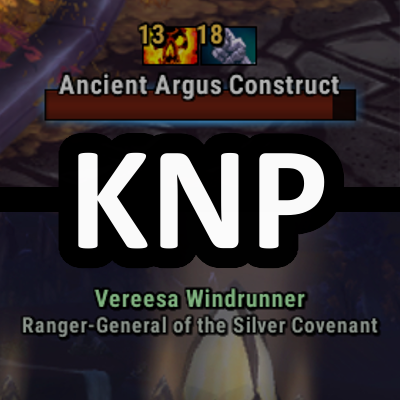 This is vanilla nameplate behaviour inherited by KNP as of 2.19. Check the "allow Kui Nameplates to modify CVars" option under /knp > CVars, then check "disable scaling" and "disable fading." KNP also now inherits the game's line-of-sight alpha modifier by default. To disable that, set "line-of-sight alpha" under /knp > CVars to 1. 4. Why is there a nameplate under my character? That's the personal nameplate which was added to the game in Legion. Here's how to disable it. By default, it only shows while you're in combat, or when you otherwise receive damage or healing. There are some options for this behaviour under /knp > CVars. 6. Nameplates keep appearing/disappearing after I enter/leave combat! If nameplates are being shown upon engaging a boss, this is done by boss mods like BigWigs or DBM so that they can show you extra information on them. You can disable this by unchecking /knp > boss mods > "allow boss mods to control visibility..."
Otherwise, make sure the "combat action" drop-downs at the top of /knp > General are set to "do nothing". If that doesn't fix it, make sure "always show nameplates" is checked (see FAQ 1). If it still happens, then another addon is doing it. 7. Why don't unattackable enemy players (e.g. in sanctuaries) have nameplates? The game doesn't render nameplates for unattackable enemy players. Addons can't change this. The in-world floating names aren't nameplates and can't be modified by add-ons (except the font). 8. Why doesn't [ability] show in the aura frame? Note that only buffs on friendlies and debuffs on enemies will be shown by the auras module at the moment - you can't currently configure it to show debuffs on friends or buffs on enemies (not counting those shown by the boss mods module). With that out of the way, the ability might not be included in the default filter. You can use KuiSpellListConfig to change which spells are shown.